Kelly Kohen was one of the first to jump on the Web Marketing Therapy bandwagon, joining the team after years of working in the dot com world with Lorrie Thomas Ross. Kelly is the first person most potential clients come in contact with at WMT. She has super secret special skills to get great deals on domain purchases, as well as working with clients on website updates, SEO, AdWords, blog content and meta-data, while also working behind the scenes at WMT to support the team. Kelly has Bachelor’s degrees in Communication and Business Administration as well as being a culinary school graduate. The last degree may not seem to fall inline with marketing, but my, she can make a mean dessert! Kelly is passionate about helping people, and this flows into her non-work hours as well. She loves spending time with her husband, son and a house full of animals-a dog, two cats and sometimes a mini potbelly pig. 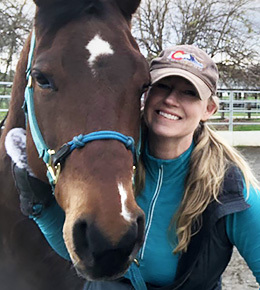 When she is not in front of her computer, she spends countless hours volunteering as a PE teacher at her son’s elementary school, helping run events to raise money for the PTA or sneaking off to spend some alone time with her horse, Daisy.